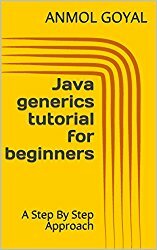 Java Generic methods and generic classes enable programmers to specify, with a single method declaration, a set of related methods, or with a single class declaration, a set of related types, respectively. Generics also provide compile-time type safety that allows programmers to catch invalid types at compile time. This reference will take you through simple and practical methods using Java Generics.AudienceThis reference has been prepared for the beginners to help them understand the basic functionality related to functionality available in Java Generics.PrerequisitesBefore you start doing practice with various types of examples given in this reference, I'm making an assumption that you are already aware of basic Java Programming.